One of the keys to effective influencer marketing (aka getting real results) is doing it authentically. Influencers get countless emails, all wanting something from them, and most of them coming in the form of a generic, template email that can be spotted a mile away. Now consider that these influencers are people just like you and me, also with an inbox full of spam and junk mail on top of receiving a hefty amount of these (often impersonalized) influencer requests. Is it any wonder that they rarely respond to them? The odds are definitely not with you if you’re contacting an influencer, regardless of how good the business opportunity is that you’re offering – that is of course, unless you can find a way to ensure that your request stands out, gets their attention and makes them way to know more. In this post, I’m going to share seven key strategies to help ensure that you stand out in the inbox of your desired influencer, setting the ground work to establish a solid, mutually beneficial relationship. It’s extremely important when communicating with influencers that you’re concise and to the point. It’s hard to do this if you’re not sure what the point is. In fact, how can you even be sure you know what influencers you should be reaching out to, if you don’t know what you are trying to accomplish? Step one is to figure out exactly what you want to accomplish using the help of influencers. Additionally, knowing your goals is vital so you know how you’re going to measure the success of your efforts, which will help you determine how to be more effective with your influencer marketing in the future. Can help you accomplish the goals you have determined. Start by looking at the demographic they appeal to. Is it similar to the demographic that you serve, or is it one you’d like to branch out into? Then look at how they interact with their audience and what kind of content they create. Do they make YouTube videos, or post Instagram Stories? Do they live-stream on Facebook or post articles on LinkedIn? The social media platforms they use and the type of content they create will heavily influence your decision. If they’re using a platform that your customers don’t use, or create content in a format they don’t prefer, quite simply, it won’t be an effective alliance. Ask yourself how that influencer would make best use of your product or service. If you can’t see them finding value from your product or service, and being able to share that with their community, they’re probably not a good fit for you. After you’ve selected the influencers you’re interested in reaching out to, be prepared to spend as much time as necessary to thoroughly research each one of them. Be as detail oriented as you can in your research, as this can help you identify not only what’s important or of interest to them, but it can also help you to determine the best way to make contact. Influencers are a trusted authority on their topic, they consistently engage their community and provide helpful knowledge and guidance. Be sure to look for these characteristics when choosing your influencers. Start by looking through their social media profiles – check out their bios, photos, videos and most recent posts. Check out their website if they have one. Spend time familiarizing yourself with their content. Also look at their community. What kind of following do they have? How does their community interact with them? Even if they have a smaller community, if they’re loved and have a strong influence over their community (which is your targeted demographic), it can be well worth the time to approach them. On the flip side, if they have a huge following but very little interaction with their community, they might not have any real influence with their audience at all and may not be worth your time. As noted earlier, Influencers email boxes are often overfilled, so even if you write an attention getting subject line, your email can still get lost in the noise. You can help increase the chances of success of your first email request by setting the stage. You do this by familiarizing them with your name and the name of your brand. So how do you get on their radar? You already know what social media platforms they use and the kinds of content they create from your research. Start by connecting with them on each of their platforms, in a manner appropriate for each platform. For example, follow them on platforms like Twitter, Instagram and Facebook (don’t try to friend them immediately). Subscribe to their YouTube channel or send them a personalized connection request on LinkedIn. Once you’re familiar with their content and community, make meaningful comments on their posts. Ideally you want to work toward creating a discussion. While the occasional “awesome” or “great post” comment is appropriate, these types of comments will likely not get you on their radar. Your overall goal for these interactions is that your name will be somewhat familiar to them when it pops up in their email box. Combined with a great subject line, this will make them much more likely to take the time to open your email and read it. The subject line of your email request can determine the success of your outreach to influencers. Even if your name seems familiar, if your subject line is ineffective, they’ll skip over it with the rest of the junk in their inbox and delete it. Ensure your subject line stands out. Whether you go for an attention-grabbing subject line or one that perhaps references some of their past work, keep it short and informative so they know what to expect. The body of your email needs to be equally short and to the point. Good etiquette never goes out of style. Start your email off with a personal greeting that includes their name. Add a personal touch by complimenting them on their work. For example, you might mention that you regularly read their blog posts and find them extremely insightful and well written. Perhaps mention your favorite post and why you like it. Next you’ll want to dive into your purpose. Tell them why you’re writing to them. This should be only a sentence or two, you don’t want to go into a lot of detail here. Your goal is not to lay out your whole vision but rather to find out if they’re interested and a good match. Go on to explain in a sentence or two exactly what you want from them. Clarity in this step can help prevent wasted time on both sides. Then you need to let them know how they’ll benefit from this partnership. Briefly explain why they should agree to your request. Finish your email by letting them know they can reach out with any questions and add an appropriate closing salutation. It can often be helpful if you include your social media profile links as part of your email signature, so they can easily research you and your brand. The entire message shouldn’t be more than five to ten sentences long. Make it easy and quick to read. If you don’t hear back right away, wait a few weeks before writing again. You may need to try several times before you get a response. Be patient and keep in mind that they receive hundreds of emails every day. Once they’ve responded that they’d like to work with you, the effort doesn’t end here – now the process of actually building a relationship with this person begins. Like all relationships this takes time and effort. Some ways you can do this effectively include being quick to reply to any communication with them and by taking the time necessary to answer any questions or concerns they may have. Reciprocity can be a valuable tool when building relationships with influencers. Look for ways to add value to your relationship with them. As an example, is there some kind of free gift or offer that you can give to them to share with their community? Make sure that the gift will truly be valued by their community and doesn’t come across as gimmicky or salesy. 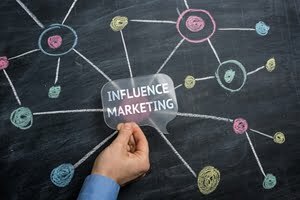 While it may feel like a success just to find and start relationships with the appropriate influencers, it’s important to track the success that each one contributes to each of the goals that you first determined for your influencer marketing initiative. It’s only by measuring and analyzing the success of each of your influencers in attaining your goals that you can make timely choices to modify your influencer marketing strategy to get the best results and with the right people. Influencer marketing is one of the most effective and efficient ways to connect and gain credibility with your target market – if you do it correctly. Done incorrectly, influencer marketing can waste large amounts of time and money, and potentially hurt your brand image. The secret to effective influencer marketing is that it’s all about connecting with individuals who share the same overall values and ideals as you. In addition, you want to build a mutually beneficial relationship and partner with each other in ways that make you both more successful. The key ingredient is to be authentic and personal, just as you would in any other meaningful relationship. Have you tried influencer marketing? What was your experience? Let me know in the comments below. The post 7 Strategies for Effective Influencer Marketing appeared first on Top Dog Social Media.